In George Orwell’s dystopian classic Nineteen Eighty-Four the United Kingdom – now a vassal province functionally named “Airstrip One” – is embroiled in a three-way war. This war, which will not, and indeed cannot, end, is fought between three factions who are each so powerful and dogged in their ideology that even when one is faced with the occasional (and cynical) alliance of the other two, none of the factions can be defeated or destroyed. In the world of Nineteen Eighty-Four, the war goes on forever. Since June 24th 2016, Theresa May has been faced with the two factions of Leave and Remain splitting into three irreconcilable, mutually indestructible groups. Soft (“deal”) Brexiteers, Hard (“no deal”) Brexiteers, and the remains of Remain – the latter vaguely divided into moderates calling for a second referendum or Peoples’ Vote, and radicals demanding to “Exit Brexit” at all costs. While this tripartite split has been overlooked by the endless Leave/Remain squabble of the last two years, in her speech on 14th November 2018 to announce that a draft agreement had been reached by her cabinet, May acknowledged the three future options for Britain – Deal, No Deal, or potentially Remain. While this may appear a small but symbolic victory for Remainers, having a “Remain” option as well as a watered-down soft Brexit, the reality is that it reveals how Brexit is now destined to fail everyone – except the far right. With the US midterm elections and a new squabble between Brussels and Rome, Brexit has retreated from political consciousness in the UK. This is exacerbated by Brexit Fatigue – for two years Brexit has been so prolific in the British news, people are exhausted by it. Theresa May’s announcement of a draft agreement only serves to highlight the disappointment piled upon this exhaustion. May has not had an easy job, especially for a Remainer delivering Leave, and her announcement on 15th November that she would stay on to deal with Brexit regardless of her party’s attitude displays an integrity which, for better or worse, distinguishes her from David Cameron and from her empty-handed critics in the Conservatives and Labour. A Brexit based on the binary split of Leave/Remain would disappoint half the population, with a victorious majority obliged to reassure the losers that they were at least upholding the spirit of democracy. But a trinary split between Hard Brexit, Soft Brexit, and Remain will disappoint two-thirds of the population, if not the entire population, by delivering too much for some factions and not enough for others. No matter what May chose, she (or any other leader) was guaranteed to alienate and anger a loose alliance of the other two factions crying “this is not what was voted for”, because a proposed agreement is simultaneously too much and not enough. First, the increasing impossibility of resolving the crisis with a vote. Calls for a second Leave/Remain referendum have been made since before the results of the first referendum were even known, and two years of debate have seen all arguments in favour and opposed, against a backdrop of endless new polls claiming a tiny majority for one side or the other, repeated and recycled to the point of exhaustion. Meanwhile the calls for a “Peoples’ Vote” on a Brexit deal have amounted to nothing, not least because of concerns that it would require a three-option ballot paper – Leave with No Deal, Leave with a Deal, or Remain. 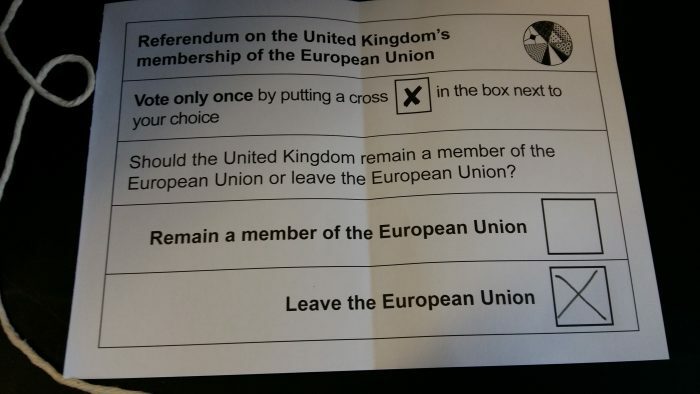 To many, this is a transparent attempt to split the Leave vote in two, and it raises serious constitutional problems. If it is unfair for 52% to determine the nation’s future in a two-option vote, how would it be any fairer for 35% to determine the nation’s future in a three-option vote? Meanwhile, hopes for yet another General Election will amount to nothing. No leader could successfully negotiate this toxic atmosphere without alienating two of the three factions, and given that May’s Conservative opponents are harder Brexiteers and that the Labour party is now under the complete control of unrepentant Leavers, an election would change nothing. It seems that the decision of 23rd June 2016 is indeed binding; not for constitutional, legal, or philosophical reasons, but because Brexit Fatigue and disillusionment in democracy make any other option a very dangerous idea. Second, by choosing one of the three factions – Hard Brexit, Soft Brexit, No Brexit – May has alienated two of the three mutually irreconcilable groups. The 14th November 2018 transitional agreement is a watered-down Chequers Proposal, one which satisfies nobody and drives the most bitter of political opponents into sudden allies. Remainers are upset that it is any form of Brexit, paying an enormous sum in exchange for fewer rights and a tumbling economy. Soft Brexiteers are angry at the proposed customs border down the Irish Sea, threatening the constitutional integrity of the United Kingdom, or incensed at the idea that May’s proposal is BRINO – Brexit In Name Only. Hard Brexiteers are outraged that Britain could essentially become what Jacob Rees-Mogg terms an EU colony, a vassal state not unlike Airstrip One, in which Britain will have far less sovereign power, and major decisions will be taken by EU institutions with even less democratic accountability to the British public, than before 2016. When arch-remainers and arch-leavers such as Tony Blair and Boris Johnson find themselves united against Theresa May’s “surrender”, alarm bells ring very loudly. The result, as a wave of government resignations demonstrates, is that all three factions will see this as betrayal. Third, and related to betrayal; the only winners of Brexit – whether it is hard, soft, or dropped altogether – will be the forces of anti-liberal democracy. The hard left and the far right will benefit from what will inevitably be portrayed as the country being ‘sold out’ by a bourgeois capitalist establishment intent on oppressing the working man, or a sneering London elite contemptuous of the nation beyond the capital. The continued constitutional and territorial integrity of the United Kingdom of Great Britain and Northern Ireland is not the only thing genuinely threatened by the Prime Minister’s proposed deal and the poisonous atmosphere surrounding a Brexit which, at best, will alienate two-thirds of the population, and at worst will disillusion everyone. Liberal democracy itself is threatened. Exactly one hundred years ago, millions of Germans awoke to news that their government had surrendered to the Allies. In the chaos of late 1918, disillusioned and angry Germans rallied around the myth of a “Stab in the Back”; the idea that the nation had been betrayed by sanctimonious, metrocentric, xenocentric cosmopolitan elites in the capital, and flocked to the rhetoric of the extreme left and extreme right who blamed the democratic centre for Germany’s defeat. As disillusioned and angry Britons from all three factions face the news of Britain’s “surrender” to the EU, a stab in the back myth is already becoming an extremely potent symbol for dejected, jaded, and Brexhausted people seeking someone to blame. Anti-democratic forces are already growing in the UK, and a Brexit which leaves two of the three factions feeling betrayed will make this much, much worse. Dealing with a Brexit which looks set to drag into the foreseeable future with no resolution, is not a scenario akin to Goldilocks and the Three Bears – a choice between too hard, too soft, or just right. The choice between No Deal, Deal, or Remain is nothing more than a choice between disaster, disaster, or disaster. And like the nightmare world of Nineteen Eighty-Four with its endless war, this three-way war cannot, and will not, be won. Dr. Patrick Bijsmans is Assistant Professor in European Studies at Maastricht University. His research interests include Euroscepticism, media coverage of EU affairs and the European public sphere, as well as issues related to teaching and learning in European Studies. He teaches BA and MA courses in in European Studies, covering topics such as EU politics and academic research and writing skills. He also coordinates the teacher training trajectory of the university’s Faculty of Arts and Social Sciences. Dr. Russell Foster is Leverhulme Early Career Fellow in European Studies at King’s College London. Prior to this he was a Marie-Curie International Fellow in European Studies at the University of Amsterdam. Russell studied History at Corpus Christi College, Cambridge; International Relations and Human Geography at Newcastle University, UK; and he was a Visting Scholar in European Studies at Virginia Tech, USA. His research interests include nationalism, identity, the EU as empire, and the history of European integration. Russell teaches BA and MA courses in European Studies at King’s. His first book, Mapping European Empire, was published in 2015. He is currently writing his second book, Feeling EU-ropean? Europhilia and Euroscepticism in the Twenty-First Century.